Now is probably as good a time as any to confess that I have a pretty serious issue with raisins. Like, I have a hard time even just calling them “raisins” and not the-evil-scourge-raisins, which is what I believe them to truly be. Still, it’s okay with me if you like them. More for you! Anyway, this whole raisin issue kept me from trying a number of foods for a long time. Scones were one of these casualties. But another one was carrot cake. Carrot cake is especially dangerous to raisin-haters since some genius introduced golden raisins, which should pretty much be labeled “now even harder to pick out!” Not fair, I say. 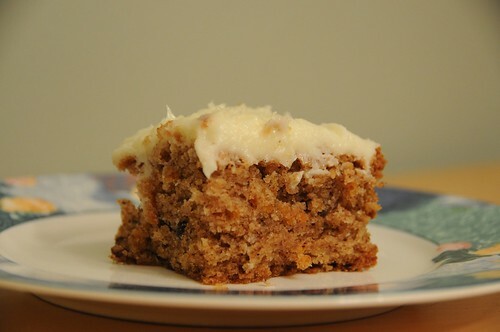 Then, one fine day, I came across this recipe, from a fellow raisin-hater, and I knew that fantastic carrot cake would be mine, any time I wanted it. Bliss. Preheat oven to 350 F. Grease a 9×13 inch pan. Chop the ends off the carrots. Wash or peel them, then grate. The easy way to do this involves a food processor. The hard way involves, you know, a grater. Either way, look out for fingers! You want to end up with about 1 1/2 cups of grated carrot. In a big bowl, mix the oil and sugar. 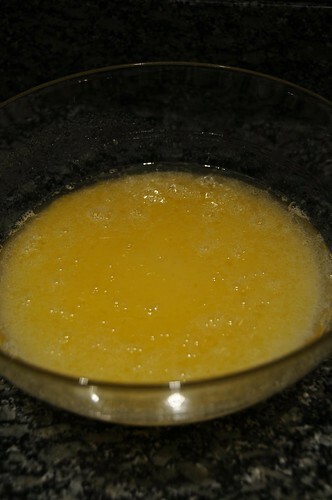 Beat in the 4 egg yolks, then add the water. 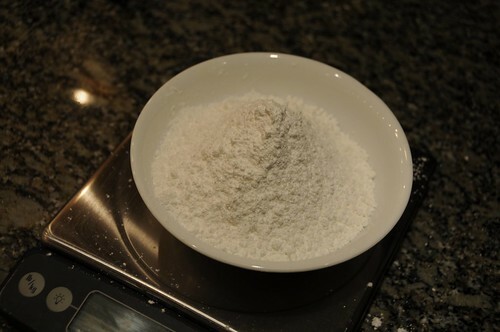 Add the flour, baking powder, baking soda, salt, and spices. (If you have lumps in your stuff, you might want to do this through a strainer, but I’m generally not bothered.) Stir in carrots and nuts. Batter will be very thick. In another bowl, beat the egg whites with an electric mixer until stiff peaks form. Stir about a quarter of the egg whites directly into the batter to lighten it up, then gently fold the rest of the egg whites into the batter. A rubber or silicone spatula is your friend here. Pour the batter into the pan and bake 50-60 minutes, or until a toothpick inserted into the center comes out pretty cleanly. (Crumbs yes; batter no.) Let cool. To make frosting, whip together butter and cream cheese with an electric mixer. Add 1/2 lb. confectioner’s sugar and mix until it’s as lump-free as you require. (If you are really strong on the lumplessness, you might want to put the sugar through a sifter.) I found this plenty sweet, but if you like it sweeter, go ahead and add more sugar. Frost the cake when cool. I like to do this right in the pan, but if you have a platter that will hold the whole cake, go for it. Alternately, you can bake the cake in two eight- or nine-inch round pans, in which case you’ll want to double the frosting so you have enough for a layer cake.